Itaipu Binacional was built in the 1980s under an environmentally careless approach, carrying out aggressive land degradation and deforestation processes to develop extensive mechanized agricultural farms in the region. Environment was seen as a limiting factor for economic development, thus the intensive growth and activity lead to a reduction of biodiversity, disappearance of certain riverheads and degradation of water quality in surface and groundwater sources. In this context, a new approach to land and water management was required, establishing river basins as the management unit, and setting water as a central axis for interconnection and motivation. This need gave birth to the ‘Cultivando Agua Boa’ program. The program aims to protect natural resources and fight poverty in the region. It thus works on social and environmental problems, promoting a new vision of water resources use through the participation of all stakeholders involved. 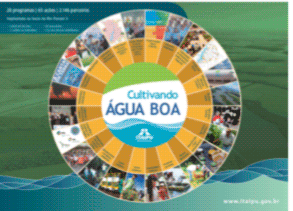 The ‘Cultivando Agua Boa’ program aims to protect natural resources and fight poverty in the region. It thus works on social and environmental problems through the participation of all stakeholders involved. It is a systemic program based on civil society participation, where water is used as the backbone for a series of actions, with the objective to fight poverty and climate change. It represents a new way to substitute the old habits by sustainable and participative practices focused on those territories where natural resources are threatened. It works with an awareness plan composed of 60 actions, which to date has enabled the following main achievements: recuperation of 200 micro-basins in the region, upgraded water quantity and quality, reduced soil erosion, improved life quality and social insertion of local people, reforestation of riversides, increased nature conservation and a participative water management promoting water stewardship and sustainable land management. The recuperation of 206 micro-basins in the region, which involved the conditioning of 3,709 km of paths, distribution of 160 water suppliers, conditioning and remediation of 22,528 ha of agricultural lands and restoration of 1,321 km of riverine buffer zones. The creation of 29 Municipal Management Committees and 10 thematic Management Committees, with participation of 1,247 organizations. Through specific actions like facilitating small farmers capacitation, new rules for the purchase of organic products for school canteens have been developed. Meanwhile, the inclusion of alternative medicine in public health centers has been promoted, thus creating a new market niche and source of employment. The constitution of 90 learning communities according to the environmental education policy, through the application of the ‘People who learn by participating’ (PAP in Spanish) methodology. Development of protection and recuperation activities for riverheads, vegetation and riparian forests, as well as planting 3,500,000 autochthonous trees. Creation of two biological sanctuaries holding more than 44 protected species as well as a 13 km biodiversity corridor. Conducting an awareness-raising campaign about water ethics and protection and sustainable development for more than 200,000 local people. An Environmental Education Network with 300 monitors, 450 educators and 750 basin managers was created, together with an educators’ collective. Improving the quality of life of 6,000 waste collectors by creating 5 cooperatives and 25 associations. This has enabled an increase of waste collectors’ rents above 500% as well as increasing their dignity through better work infrastructure and capacitation courses. Improved life quality for 270 indigenous families through nutrition programs, provision of agriculture inputs, strengthening of culture and traditional pottery and construction of decent schools and houses. ONE DROP uses water to drive change with a unique approach that empowers people to improve their living conditions. Called the “ABCs of Sustainability”, it is based on 3 complementary components designed to establish a solid foundation on which communities can build and flourish: Access to Water and Sanitation (“A”); Behavior Change through Social Arts (“B”); Capital/ microloans (“C”) for economic development. Project India is rooted in the “A” and “B” components. It is implemented in Odisha, which is among the seven poorest Indian states. Carried out over four years (2011- 2014), it implements sustainable solutions to the problem of poverty through a WASH program designed/implemented by Gram Vikas whereby a 100% coverage/inclusion method ensures access to a toilet, a bathing room and water available 24/7. 1. 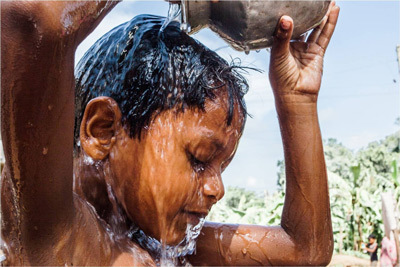 Access to Water, Sanitation and Hygiene: improve access to safe drinking water, sanitation and hygiene by building dignity and social inclusion. 2. Behaviour Change through Social Arts activities: raises awareness of the intervention zone population to change their hygienic and sanitation practices and become mobilized to manage water sustainably. The purpose of the project is to facilitate and accelerate participation and thus the implementation of Gram Vikas’ program in 100 villages by developing artistic activities firmly rooted in local culture to raise collective awareness, educate and mobilize the populations around WASH issues. ONE DROP draws inspiration from circus creativity to develop professional artistic activities in order to inspire people and enable the process of social change. Using a community approach, the project directly benefits more than 58 000 people of both genders, all ages and castes. Globally, the behaviour change activities helped to raise communities’ awareness and understanding of the impacts of poor hygiene. The activities generate a sense of empowerment for villagers who feel they are no longer beneficiaries but real participants in the project. The artistic workshops successfully contribute to “transform” villages from reluctant to engage in the WASH program to understanding its value and potential, helping to reach the 100% consensus for Gram Vikas WASH program. Indeed, 74% of the target population have reached consensus and are now engaged in the program, with 16% of villages already fully covered. Following the workshops, an improvement of the sanitation and hygiene behaviors could be witnessed in several villages where, for instance, women were no longer using the local stream to bathe and toilet use had increased. As reported by the villagers themselves, the practice of open defecation has reduced and children have demonstrated better hygiene practices. The entertaining nature of the artistic activities ensures the participation of all categories of people, effectively breaking the caste, class and gender divide. Finally, conflicts over water have decreased in some villages, demonstrating how social arts can generate engagement and alleviate social disparities. 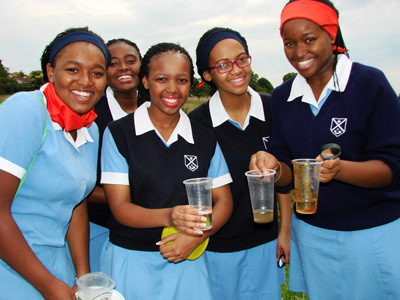 The DWS/ WESSA Eco-Schools Water Project was born from discussions during the 2013 UN International Year for Water Cooperation which raised awareness regarding the importance of multiple actors working together for better water management. The key partners are DWS and WESSA Eco-Schools; however, many other stakeholders and partners are involved at both a macro (National/ Provincial) and micro level (school level). The project comprises a partnership which aligns Government priorities with NGO/ civil society objectives such that the pooling of resources and networks of best practices can result in better water education, management and outreach. This project’s main objective is to strengthen water education through implementation of the Eco-School’s 7 step framework for ESD learning and change. These steps guide schools through a learning process which promotes water conservation and sanitation education as well as engaging learners in enquiry-based learning methods which empower them to better understand their local water context and to take action to improve this. The project has a strong inclusivity focus, emphasising public participation, participatory learning processes and action taking for better water management and to ensure water security for the more disadvantaged communities that do not have access to potable water especially in areas where water is increasingly becoming scarce due to climate change and poor catchment management practices.